If you have ever asked yourself the question, “What is Scientology?” this new film is one you must see. 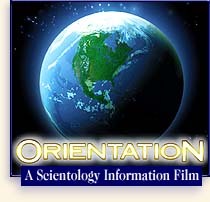 “Orientation” takes the viewer inside a Church of Scientology for a first-hand look at the religion. It describes Scientology beliefs and practices and shows them in action. Scientologists from many walks of life are featured, describing what Scientology means to them and its profoundly positive effects on their lives and those around them. The public is invited to see this 37-minute film for its excellent explanation of the religion and what it means to be a Scientologist. There is no obligation and, of course, there is no charge. Now showing at Churches of Scientology throughout the Los Angeles area. For the address of the Church or Mission closest to you, see “Visit our Churches of Scientology”.